The 2014 edition of Capt. David Perry's Recollections of An Old Soldier follows the text of the original 1822 edition (except as indicated in notes), with very little editing of puntucation, etc. For this edition, all previous editions (1822, 1912, 1928 and 1971) have been consulted and all editions meticulously compared, with discrepancies included in brackets. Expected to be available within the coming year, the 2014 edition includes a preface, introduction, illustrations, footnotes, endnotes and maps. Locations of all known extant editions and a short discussion of each, some with remarkable stories, make up one appendix. This new edition will be the first generally available hard copy of Perry's Recollections since the 1971 edition. Completion has been delayed since before 2002 because of chronic illness, but the wait will finally be over with a resulting work that will be well worth it. Every effort will be made to keep the project's size under control, and cost down. See The Captain David Perry Web Site or click here to read excerpts of Recollections and articles on David Perry and his memoir. 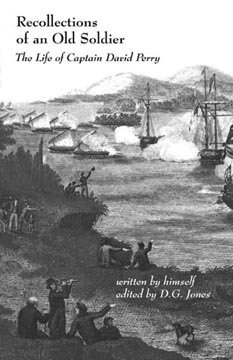 "Captain David Perry: Provincial Soldier, American Patriot"
"FACT OR FICTION: References to Captain David Perry's Words"
Recollections of an Old Soldier: The Life of Captain David Perry A Soldier of the French and Revolutionary Wars. Containing Many Extraordinary Occurrences Relating to His Own Private History, And an Account of Some Interesting Events in the History of the Times in Which He Lived, No-where Else Re-Corded. Written by Himself. Windsor, Vt. Printed & for Sale at the Republican & Yeoman Printing Office, Directly Opposite the Bank of Windsor.